Set Your Intentions! Workshops – this weekend! If you are like most of us, you have at least given a few minutes of consideration to setting goals and resolutions for the new year. AND if you are like most of us, these resolutions fade fast. So … how do we hold to these resolutions? How do we treat them as our “north stars”, allowing them to guide us through a process of growth and change? 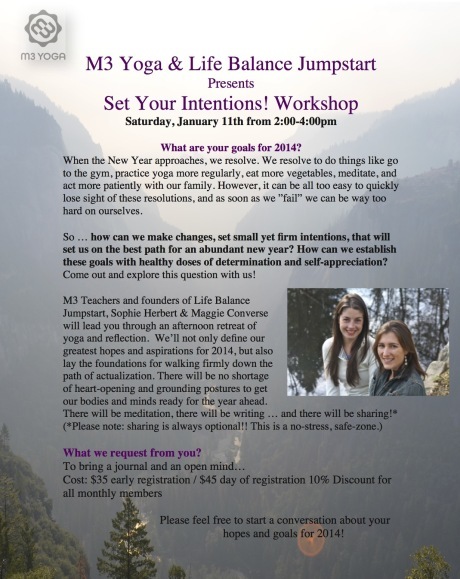 If you happen to be in the Fairfield County area this weekend, I will be co-teaching an intention-setting workshop twice with Sophie Slater. The first will be at M3 Yoga in Westport on Saturday 2-4pm and then again on Sunday 3-5pm at A New Earth Yoga in Easton, CT.
…for the m3 workshop email merri@m3yogawestport.com. …for the A New Earth workshop click here.